Toddlers love to count anything; cereal at breakfast, cars and toys. The possibilities are endless. Toddlers love to count on their own fingers and toes. Do not worry if your kid counts out of order, learning the number words and oral language skills are all new concepts for your toddler. Count objects around your house. How many doors do we have? Everyday objects are fun to count such as stairs, shoes, toys, cars, stuffed animals. 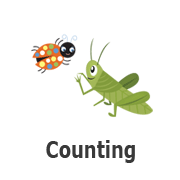 Count everything you see, so your toddler will get the concept of counting, one to one correspondence, and basic number skills. Have your toddler help with the laundry. Count socks with your child. Sort them based on size, color and match the pairs. Laundry is a great way to talk about size, colors, shapes, sorting, counting and matching. It is a great math activity! Toddlers love to help. Have your toddler help you cook, read a recipe and retrieve items for the recipe. Even young children can help fill, stir, and pour. Through these activities children learn to count, measure, add, and estimate.